Two harrowing, shame-filled years in Iran’s Evin prison. When unrest erupted in the streets of Tehran during the late 1970s, the author, daughter of Russian-Iranian Christians, was hardly aware of politics. Then her friends began to disappear one by one, seized first by the shah’s police, then by Khomeini’s fanatical supporters. Schools were shut down in the fall of 1978; when they reopened in 1980, teachers had been replaced by inexperienced revolutionary guards who preached politics rather than academics. In 1982, 16-year-old Nemat had the temerity to challenge her calculus teacher, inadvertently prompting a walkout by other frustrated students that gained the attention of authorities. She was arrested, blindfolded and taken to Evin, where she was tortured and put in line for execution. 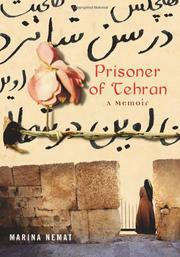 At the 11th hour, one of her tormentors, Ali, persuaded the ayatollah to commute her sentence to life in prison. Her will was nearly broken by violence and despair, yet she managed to keep her sanity, bonding with other miserable women and even lending help whenever she could. Then Ali confessed that he’d fallen in love with her and forced Nemat to marry him by threatening to have her boyfriend Andre and his family arrested if she said no. Incredibly, she not only converted to Islam but tried to love Ali. Pregnant when he was assassinated in front of her, she lost the baby. She married Andre, and in 1990, they were able to leave Iran with their young son; they have lived in Toronto since 1991. Anguished that she survived when so many others perished, Nemat pays tribute to them by testifying about her ordeal in spare, moving prose devoid of self-pity. <\b>An important eyewitness account, and a worthy companion volume to Davar Ardalan’s My Name Is Iran (Jan. 2007).